If you regularly read through articles that relate to gaming and/or gamification, you will inevitably come across models that explain the various Player Types of what type of people play games and what their interests are. The most famous, and probably most widely used theory/model is Bartle’s Player Types, which splits people into four categories: Achiever, Explorer, Socialiser, Killer. There are other variations and expansions on this model from Lazzaro, Callois, Kersey, and other psychometric tests, many of which are explored in detail in this Gamasutra article. The problem with many of these models is that they are either incomplete, too narrow or not broad enough. Or as some may argue, too broad as the number of variations no longer allows for ease of use when developing a platform or service. Perhaps there is a middle ground, many of these aren’t broad enough but they need to remain easily accessible to a broader public. Maybe using easily recognizable archetypes, such as those posited by Karl Jung would aid creators and developers. And with that, you must remember that when implementing gamification anywhere that you do a carefully executed qualitative research of the community you are delivering to. So that you can more accurately determine what you are catering for and what is needed in terms of each player type present. As Dr. Bartle himself has said on many occasions, and this is true of any taxonomy and psychometric, these models don’t exist to put people into neat little boxes, but to create a better understanding and naming of the varying types of interests that each individual has when they play a game. Each game or gamified environment will probably lean towards one of these types, due mainly to the creators own interests, but through diligent qualitative research, you can create a more holistic environment that can cater and engage a broader audience as well. It is important to reiterate that every person has all the varying player types in them, just in varying amounts. Some types are more dominant than others, and some will come more to the fore depending on the game or environment the player finds themselves in. This is either due to the individual’s inclination or what the game draws out of that person. The various player types are aimed at what people find fun, what motivates them to play the system you have created. What objectives they enjoy and what type of agency is created within them. As such, to get a better, more fuller understanding, we will break down Bartles player types into their constituent parts and explore each individually. After we have gone through all 4 types we shall see if we can create a larger, expanded version that better suits the various archetypes (taking inspiration from psychology and psychoanalysis) found in the wide world. 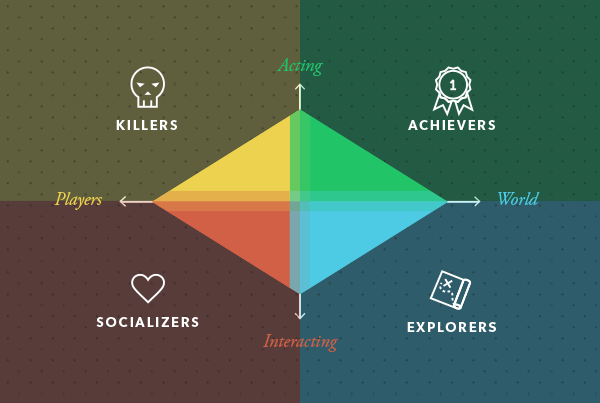 In Bartle’s player types, Achievers are in the quadrant of Acting and World. An Achievers motivation when looked from the perspective of positivist psychology lies predominantly within the area of Mastery. This area of motivation for an Achiever is therefore both Extrinsic and Intrinsic. Depending on the individual, one might be more than the other but both are always present in this type. As they have both this reflects their motivators such as craving and receiving rewards is an extrinsic motivation. Since they crave these extrinsic rewards so much, a creator of a system must be aware that Achievers will often try to exploit a system to gain the maximum rewards they can for their efforts. An Achievers intrinsic motivator is the drive to improve themselves. Self-improvement through mastery of a certain skill is at the heart of how an Achiever can keep rising above others to the highest of heights, setting them apart. These achievements are purely intrinsic as they only serve as a point of emotional, and intellectual, success. The mechanics that Achievers follow to reach these heights are to realize a particularly difficult goal, to get the maximum level, to beat a particularly difficult level, to get the highest score, collect the most item, to reach 100% completion and/or to unlock new content that no-one else has yet unlocked. For an Achiever, their main impetus is that they have achieved something that no-one else has yet. They have a strong drive to be the first, in many MMO games you will see Achievers in groups that strive towards “World First” achievements, that is the nirvana for this player type. As the Achiever is the quadrant of Acting and World, they enjoy affecting change that others are able to observe. The yearning for the admiration of others. Not in the same way as a Socialiser might when interacting with people and connecting. No, an Achiever is happy even when it is a group of complete strangers that admirers them (these usually do consist of the Socialiser type). When balancing Achievers with the other player types, besides the Socialiser above, the Achiever is the least fond of the Killer. As the Killer exists to disrupt, they will often disrupt the Achievers ability to gain new heights, making their overall experience less than optimal. When creating an environment, it’s best to aim for a ratio of 2:1 or 3:1 when dealing with Achievers: Killers. Thankfully if the ratio is around there you won’t have to worry too much as the Achievers will often outpace the Killers and the Killers will set their sights elsewhere. Explorers and Achievers, however, get along very well. 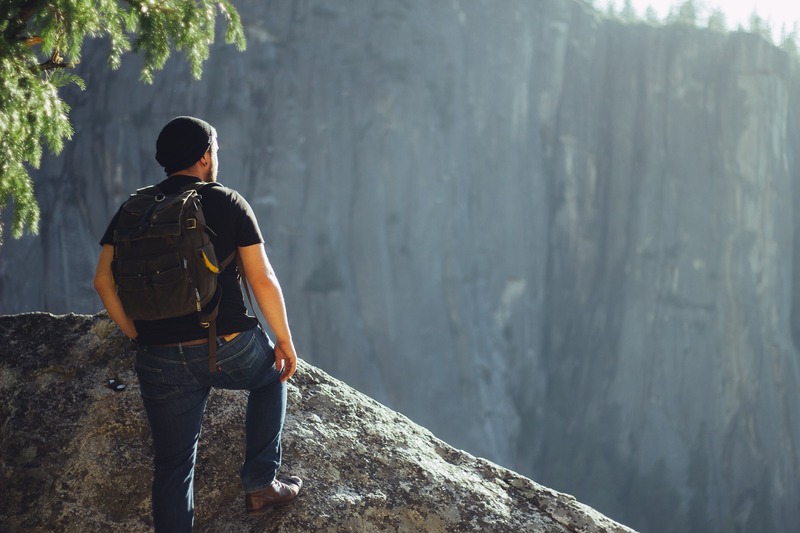 As the explorer discovers new areas/new knowledge, Achievers will often join them, as whatever the explorer finds will no doubt benefit the Achievers core drive and need. They almost have a symbiotic nature between them. When dealing with other Achievers, the relationship is generally a love-hate one. As Achievers thrive on competition but they are not really team players as such unless they can be assured that the team is all aiming for the number one spot. If you look at what drive’s Achievers, you will probably recognize yourself and others in this category, in some fashion. As stated before, depending on the environment we all feel the drive to be the first. In essence, an Achiever is an ambition to achieve a desired, exclusive goal, and the almost relentless pursuit towards that goal. What you must bear in mind when developing environments is that the Achiever is the personality type that will aim for your end-game content. Whether it be in a game of gamified setting, the end-game content is what will keep this type active for the longest, they will be your Masters, the ones that thoroughly understand your system and if they are so inclined, aid the novice in their onboarding experience. The end-game content in your environment is lacking then these personality types will drop off quickly. What you will have created is a flash-in-the-pan experience, as most will fly through from the novice stage to the master stage and continue on to the next thing that interests. The aim is that the end-game content is engaging enough that your masters become visionaries who add to the experience that you have created but this is only possible with good content already in place. An advisable strategy when dealing with the Achiever, who craves challenges, rewards, and self-improvement, or extrinsic and intrinsic motivators, is that long-term goal of continued self-improvement is created (intrinsic) and that this goal is broken down into a myriad of smaller incremental steps. Each of these steps delivers a sufficient challenge and a useful reward that moves the player up to the next level. The feedback from these rewards do need to reflect that the player is exceptional in having achieved this, otherwise, the Achiever’s drive will diminish if the feedback/rewards become generic as they move through the various tiers. By balancing a large number of small extrinsic challenges and rewards with one large intrinsic end goal, such as continual self-improvement, your retention rate with Achiever’s will be greatly increased. Coincidentally this strategy will also work with Explorers as they will also have the need to discover new content in such a way. The Achiever will be a very small percent of your player base. As not many people can sustain the drive to continually be the first, the best or the person with the most stuff/ rewards. Despite being a very small percent of your player base, they will be one of the most important. Not saying that the others we will discuss in other articles are not, but this player type will be the first to reach your end content. Therefore, it is imperative that the end content is scalable, engaging, well-developed and fully formed. As an Achiever is a very fickle type and will not suffer bad or badly created content for very long. If the Achiever is satisfied then you have a gained yourself a very important and useful ally, for if they have any social elements within them, they will aid any new players and aid you in furthering the effective development of your environment. As hopefully by now, they will have a vested interest in its well-being and continuation. Be sure to check back in the near future as we explore the other player types, their personalities and make an attempt at creating a more straightforward and expanded player type that you can use in the development of your games and gamified experiences.